UPDATE: DAS Bürgery has opened a physical shop! You can check out the review here!! 3.) Your cousin named “Boy” who hides himself in a dark cellar for most of the year and then shows up at your grandmothers birthday, becomes the life of the party and after all that, slinks back into his hole to hibernate for the rest of the year. That, my dear readers is how I would describe the RAREST, MOST elusive burger stand/company that is Das Bürgery. Spelled with an umlaut (ü) this chain is so elusive, popping up ONLY at certain select events with their extremely gourmand-type hamburgers. I was fortunate enough to catch Das Bürgery in one of their rare appearances at the Bacolod Ayala weekend Souk. (which attracts the high end crowd.) They use Angus beef in their burgers and they have a really, really premium WAGYU beef burger. The Black Label and their burgers. Bam! Sizzling Bacon! BAM! Cheese on a burger patty. Bam! Burger patties even look good without cheese! BAM! BAM! BAM! Burger patty without cheese is SPRINKLED lovingly with pepper. Heck, when I see that attention to detail… It’s got to be good! Bam! Like shots from the guns of the Kommando Spezialkräfte, these fine points immediately got my attention. This gorgeous pile of caramelized onions might also have had something to do with it. Gorgeous looking sesame seed bus and a huge pile of onions and mushrooms. It’s time for the taste test. 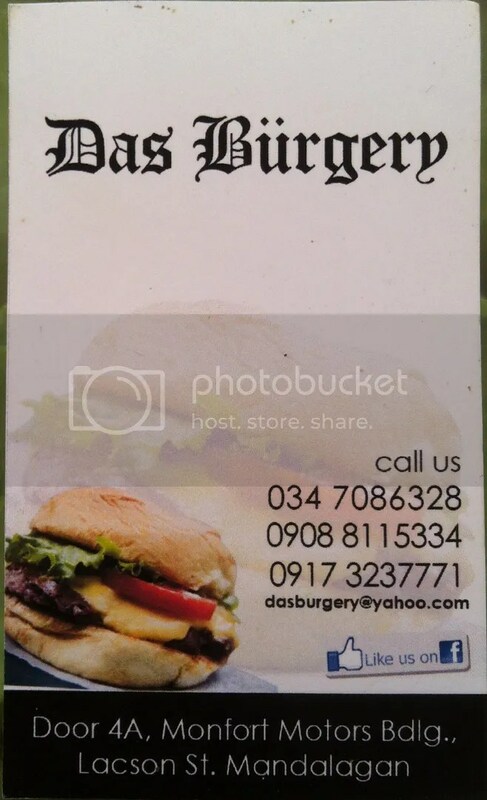 Das Bürgery’s burgers are great, with premium ingredients and simply satisfying. They only show up at events or if you hire them for parties and they have no PHYSICAL store. That’s right. Like Desert Nomads, this stall is wandering on the desert sands of Bacolod. Which simply means if you have the good luck to find them, try out their burgers! Incidentally, if you DO want to Properly pronounce “Das Bürgery” Check out this video.. Hilarity ensues.